Credit cards are offered to students who are 18 years of age and above and are graduation or are pursuing any other higher education courses. The biggest advantage of student credit cards is that the documentation is pretty simple. Most Indian parents tend to think that given credit cards to children especially those who are college students or fresh graduates is a recipe for disaster. But it is in fact quite the opposite as a credit card for a college student not only comes loaded with special features and benefits, it is also a great way for a youngster to start building her credit record. Today, let us take a closer look at the best credit cards for students in India and the benefits that they offer. Credit cards are offered to students who are 18 years of age and above and are graduation or are pursuing any other higher education courses. The biggest advantage of student credit cards is that the documentation is pretty simple. All that you need is your age proof (birth certificate) residence proof and proof of educational enrolment (the student ID card). There are essentially two categories of credit cards that students can access in India- secured credit cards or cards that are available against fixed deposits and add on credit cards. These are cards that are available against fixed deposits that serve as the credit line that the student uses. The advantage of secured card is that the credit limit is fixed up to 70-85% of the FD amount and therefore there are slim chances of things going out of hand, as compared to unsecured cards. Secured credit cards are also a great way for young college students to start building on their credit history and get into the habit of building and maintaining a good CIBIL score. The other advantages of such cards is that there is either a nominal joining and annual fee on such cards and that they come with attractive rewards such as fuel surcharge waiver, cashback in departmental stores, points on online transactions and even extra points for spends during the card holder’s birthday month! Apart from State Bank of India that offers a secured card against an FD of as low as ₹5000, other leading private banks such as ICICI Bank, HDFC Bank and Axis Bank offer such secured cards against fixed deposits that is ideal for students. The other great way to let a college student use a credit card is to hand over an add on card to her. 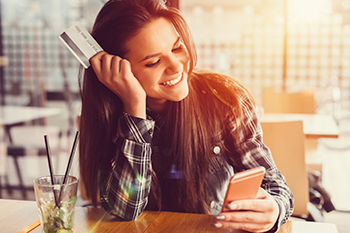 The advantage of an add on card for a student is that despite the fact that she can get all the advantages of a primary card holder, the responsibility of bill payment lies essentially with the primary card holder who is more often than not a parent. The parent can however set the credit limit on the add on card and keep track of all the transactions made on this card. However, if you are a student or a fresh graduate using an add on card that has been given to you by your parents, treat it as net practice to build good credit. Make sure that you remain within 30% of the credit limit that has been sanctioned to you and try and make the repayments on your card yourself. This will also be a great way to prove to your parents that you can indeed be responsible with your credit usage. Credit usage is omnipresent in today’s context and the millennials are far more conversant and comfortable with the idea of using credit. Realising their needs as students banks therefore are going overboard to catch them young and sweetening with tailor made credit cards and innovative reward systems. Students however should not get simply carried away by the attractive offers they make. Instead weigh your needs and opt for a student credit card only when you are sure you are ready to handle the responsibility. The author Rajiv Raj is Co-Founder & Director of CreditVidya.